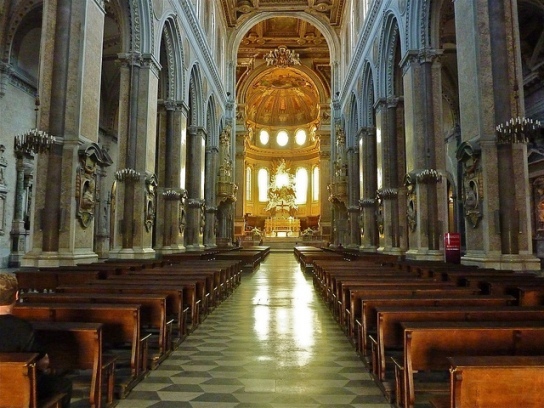 Step into the religious heart of Naples by visiting the Duomo, or Cathedral of Santa Maria Assunta, in the historic center of Naples. Also known as the Duomo of San Gennaro, the patron saint and protector of Naples, the cathedral is one of many religious sights to visit in this vibrant city on the Bay of Naples. 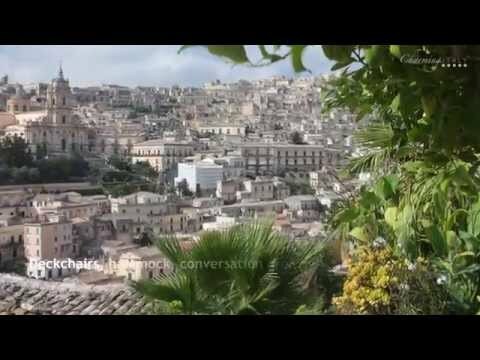 The city of Naples in southern Italy’s Campania region has many facets to discover. It is said that Naples has as many or even more churches than Rome, each one filled with art, architecture and countless stories of the Neapolitans. These are the personal stories that tell of the city’s character, identity and heart. To understand Naples is to understand and experience its beautiful churches that tell the story of the city like no history book can. The best place to begin is at the Cathedral of Santa Maria Assunta, called the Duomo, which indicates in Italian that it is the most important church in the city. 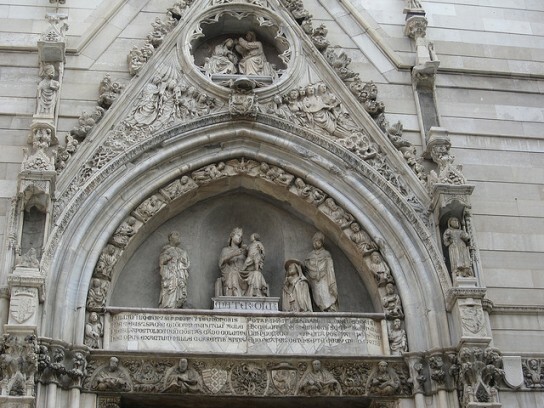 Located on Via Duomo in the historic center of Naples, the façade of the Duomo is a late 19th-century Neo-Gothic design by the Neapolitan architect Errico Alvino (1809-1872). While finished posthumously with some minor changes to the design, it is an excellent example Revivalism in southern Italy, along with Alvino’s Medieval Revival design for the façade of the Duomo of Amalfi. The main entrance, detail above, incorporates architectural elements from the 13th century, when King Charles d’Anjou founded the church. Stepping inside, the city’s history begins to unfold. High above the central nave, the early 17th-century ceiling is decorated with carved wooden panels surrounding paintings in the Mannerist style depicting scenes from the life of Christ and the Virgin Mary. Walking along the side aisles to the apse, you’ll notice that some of the chapels still maintain their original Gothic design and house many artistic treasures. The Chapel dedicated to Santa Maria Assunta in the right transept features a beautiful painting of Our Lady of the Assumption by the Renaissance artist Perugino. While dedicated to Santa Maria Assunta, the Duomo of Naples is more commonly associated with San Gennaro, or St. Januarius, the patron saint of the city. Martyred in the year 305, San Gennaro has protected the city from disasters, plagues and eruptions of nearby Mt. Vesuvius for centuries, and is an important religious figure in Naples. It is no surprise then that the Chapel of San Gennaro’s Treasure is one of the most spectacular religious spaces in Campania. Construction of the chapel began in 1527 during a terrible plague epidemic, and many of the leading artists of the time worked to create the truly sumptuous space. 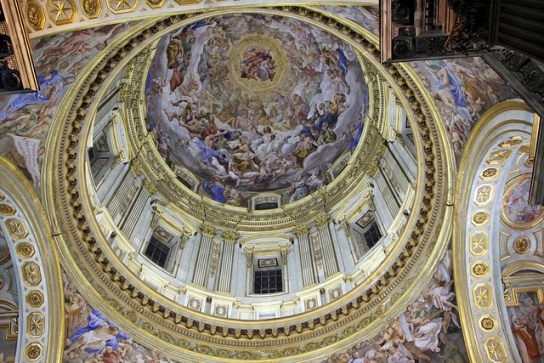 The grand dome and ceiling were painted by Domenichino and Giovanni Lanfranco, while the impressive sculptural details were created by Cosimo Fanzago. The bust reliquaries and a vial of the blood of San Gennaro are held in this chapel, and are magnificently displayed during the miraculous liquefaction of the saint’s blood on the important feast days. To experience this important Neapolitan religious tradition, visit the Duomo of Naples on the first Saturday in May, on September 19th or on December 16th. 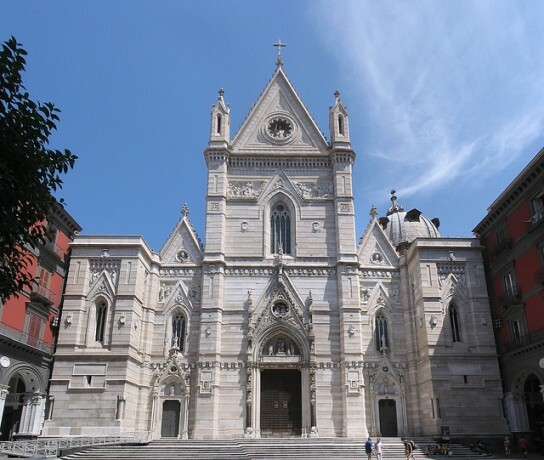 The history of the Duomo goes as far back as the life of San Gennaro and the very early Christian times in Naples. 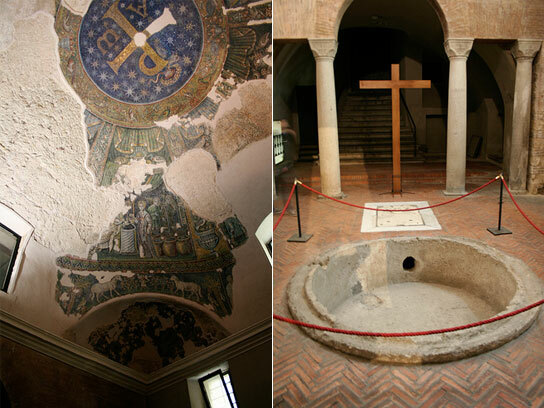 Don’t miss the chance to see the Baptistery of San Giovanni in Fonte, the oldest known in the western world, which dates from around 550 AD. The beautifully detailed mosaics in the Baptistery date from the same period and depict early Christian symbols. Step even further back in the history of Naples by visiting the archeological area excavated beneath the Duomo. As you walk along through the ruins below the church, you’ll see what remains of the ancient Greek and Roman city of Neapolis, including mosaics and architectural elements, and traces of the early Christian transformation of the religious space. The Duomo was built on the site of two previous churches, one of which was incorporated into the church itself. Just off the left nave is the Basilica of Santa Restituta, founded in 4th century by Emperor Constantine, which features ancient columns taken from a temple dedicated to Apollo that was once located in this same spot. 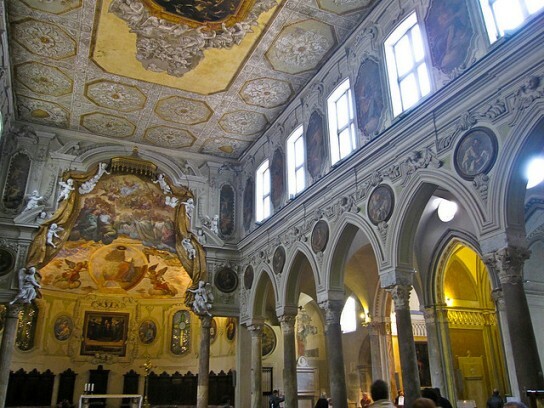 The Basilica was later redecorated in the 1600s, with the apse featuring an elaborate Baroque scene showing a theatrical curtain being pulled aside by angels. These are just a few of the artistic and cultural treasures held within the Duomo of Naples. This is one of those rare buildings that can tell the centuries-old story of a city, one that can only be experienced by walking through its corridors, naves and chapels and listening to the many stories it has to tell. 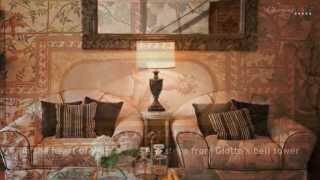 Italian history, art and traditions. 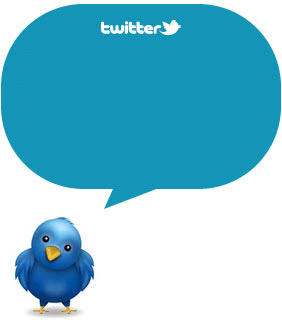 Keep you updated and follow us on Twitter and Facebook. Do not forget to subscribe to our RSS!